Trick-or-treating, also known as guising, is a popular activity among children on Halloween, in which kids dress up in spooky costumes and knock door to door for treats. It has become socially expected that if one lives in a neighborhood with children one should purchase treats in preparation for trick-or-treaters. It is a funny concept and one of the main traditions of Halloween. The activity is popular in the US and UK and is fast catching up with the rest of the world. So why don’t you join the fun? Click here to send this page to your friends. The custom of 'trick or treat' probably has several origins. Again mostly Irish.An old Irish peasant practice called for going door to door to collect money, bread cake, cheese, eggs, butter, nuts, apples, etc., in preparation for the festival of St. Columbus Kill. Yet another custom was the begging for soul cakes, or offerings for one's self - particularly in exchange for promises of prosperity or protection against bad luck. It is with this custom the concept of the fairies came to be incorporated as people used to go door to door begging for treats. Failure to supply the treats would usually result in practical jokes being visited on the owner of the house. Since the fairies were abroad on this night, an offering of food or milk was frequently left for them on the steps of the house, so the houseowner could gain the blessings of the "good folk" for the coming year. Many of the households would also leave out a "dumb supper" for the spirits of the departed. Irisleabhar na Gaedhilge, ii, 370, states that in parts of Count Waterford: 'Hallow E'en is called oidhche na h-aimléise, "The night of mischief or con". It was a custom which survives still in places -- for the "boys" to assemble in gangs, and, headed by a few horn-blowers who were always selected for their strength of lungs, to visit all the farmers' houses in the district and levy a sort of blackmail, good humouredly asked for, and as cheerfully given. They afterward met at some point of rendezvous, and in merry revelry celebrated the festival of Samhain in their own way. When the distant winding of the horns was heard, the bean a' tigh [woman of the house] got prepared for their reception, and also for the money or builín (white bread) to be handed to them through the half-opened door. There was always a race amongst them to get possession of the latch. Whoever heard the wild scurry of their rush through a farm-yard to the kitchen-door -- will not question the propriety of the word aimiléis [mischief] applied to their proceedings. The leader of the band chaunted a sort of recitative in Gaelic, intoning it with a strong nasal twang to conceal his identity, in which the good-wife was called upon to do honour to Samhain..." According to Tad Tuleja's essay, "Trick or Treat: Pre-Texts and Contexts," in Santino's previously mentioned anthology,Halloween's modern trick or treating (primarily children going door-to-door, begging for candy) began fairly recently in the US, as a blend of several ancient and modern influences. In 19th Century America, rural immigrants from Ireland and Scotland kept gender-specific Halloween customs from their homelands: girls stayed indoors and did divination games, while the boys roamed outdoors engaging in almost equally ritualized pranks, which their elders "blamed" on the spirits being abroad that night. Its entry into urban world can probably traced back in mid-19th Century New York, where children called "ragamuffins" would dress in costumes and beg for pennies from adults on Thanksgiving Day. Things got nastier with increased urbanization and poverty in the 1930's. Adults began casting about for ways to control the previously harmless but now increasingly expensive and dangerous vandalism of the "boys." Towns and cities began organizing "safe" Halloween events and householders began giving out bribes to the neighborhood kids as a way to distract them away from their previous anarchy. The ragamuffins disappeared or switched their date to Halloween. The term "trick or treat," finally appears in print around 1939! Pranks became even nastier in the 1980's, with widespread poverty existing side-by-side with obscene greed. Unfortunately, even bored kids in a violence saturated culture slip all too easily from harmless "decoration" of their neighbors' houses with shaving cream and toilet paper to serious vandalism and assaults. Blaming either Neopagans or Halloween for this is rather like blaming patriots or the Fourth of July for the many firecracker injuries that happen every year (and which are also combatted by publicly sponsored events). Given this hazardous backdrop town councils, school boards and parents in the 1930's invented this custom as it is being celebrated today to keep their kids out of trouble. As far as the custom across the Atlantic goes, by the mid- 20th century in Ireland and Britain, the smaller children would dress up and parade to the neighbors' houses, do little performances, then ask for a reward. American kids seem to remember this with their chants of "Jingle bells, Batman smells, Robin laid an egg," and other classic tunes done for no reason other than because "it's traditional." In Scotland the event of trick-or-treating is also known as guising. Little children of Scotland look cute and beautiful when they dress up in bizarre costumes. Each of the well dressed children ring the doorbell of their neighbors and yell “trick or treat!”. Little children are treated and greeted by the members of the houses with sweet tiny chocolates, small and colorful candies. Surprisingly, the occupants of the houses themselves look different as they might appear in front of the children wearing scary attires. A spooky and scary environment is set in the homes by various sound effects and occupants also use fag machines. Less creepy and frightening decorations entertain little children and young visitors. Little ones come back home with the bag full of gifts and mount up many treats. In Scotland, children are told not to recite “trick or treat”. They are likely to recite "The sky is blue, the grass is green, may we have our Halloween". The most entertaining part is that the Children use to impress the house owners with songs, little tricks, small jokes and cute dance steps. Obviously, all these are done by the little ones in order to accrue and earn their treats. It is evident that the traditions and cultures change often. Tricks are not very popular these days in Halloween. However, pranks like soaping windows, egging houses or stringing toilet paper through trees are quiet common. The night before Halloween is often marked with these hoaxes and jokes. Previously, tipping over or dislocating the outhouses were quite common act. Celebrants of Halloween used to dress themselves up to look like vampires, ghosts, devils and witches. To make such costumes two eyeholes were made on a sheet. People of Scotland and Ireland in 19th century believed that they could fool the spirits pretending that they are also the part of the other world. It could deceive and hoodwink the original spirits when they used to come with the intention of harming others. But, traditions and beliefs changed a lot in the last decade. People have walked away from the belief of making costumes in the theme of horror. Recently it is seen that on Halloween people dress up as a well known character of a popular TV show or a politician. The theme is changed according to the eventful occurrences of a particular period. Not many in America, Canada and Mexico are unaware of the campaign of UNICEF with the name "Trick-or-Treat for UNICEF". UNICEF had started this innovative and marvelous movement in 1950 to collect money for their purposes. Small boxes are handed over to the children or trick-or-treaters. According to statistics, children have collected more than $119 million from the households for UNICEF since its inception. Children in their early teenage years come out of these kind of trick-or-treat traditions and costumes. 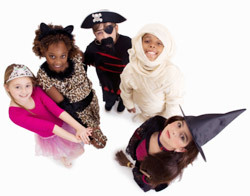 They grow up and get into the mood of celebrating the Halloween with costume parties and social gatherings. Halloween, celebrated on 31st October, is not known as a pagan holiday anymore in recent times. But the history and traditions of Halloween are dated back to the primeval Celtic holiday of Samhain. According to the Celtic tradition, people who used to celebrate Halloween were dressed up in animal costumes. It was the remarkable tradition which marked the end of summer and it announced the onset of winter. The old pagan tradition was gleefully adopted by the Christians later when they came together to celebrate the fascinating festival, All Souls Day on 2nd November. However, the traditions of wearing animal like costumes were dropped and they had adopted a better custom of wearing costumes of saints, devils, angels and fairies. They used to wear these kinds of costumes because they wanted to pay tributes to the spirits on All Souls Day. The ancient Celtic tradition was very common and dominant. The norm of Trick-or-Treating has its roots in Celtic custom and tradition as well. Samhain, celebrated on 1st of November, was treated as a day which was considered as a day to honor the deceased men and women. It was believed that the souls of the people who died in the past year were transitioned to the spirit world from this word on Samhain. Celts had assisted their deceased ancestors on their voyage by offering foods for long journey to the other world. Over the years, celebrants of Samhain are following the custom of wearing dresses like spirits. They used to exchange eatables and perform various tricks. This important and foremost tradition was known as mumming which had inspired the popular custom, trick-or-treating. It’s time to celebrate Halloween with delicious candies. A wide array of tasteful and ghoulish candies is sold in huge quantities during Halloween. Decorate your beautiful homes during Halloween and have different colorful candies that suit the moods. Plan suitably and make this Halloween special with the collections of candies. Many of us are now days concerned about the shapes of our figures and physiques. It may so happen that many of us are unwilling to swallow sugar candies. Don’t worry. Plenty of sugar free candies are also there in the market for you. Savor the tastes of the colorful and tasty candies because the celebrations of Halloween are incomplete if you miss this fantastic treat. Two dogs decide to go out trick or treating on Halloween night. Watch to see what happens when they come to a certain house to beg for treats. A fun Halloween song for kids to teach English, just fun! If any of your friends like Halloween then be sure to tell them about the video! An adorable song and video for children about trick or treating. Features puppet children and puppet goblins singing about the best night of the year for candy... Halloween. A fun, innocent song and video to sing and dance along with. Find out what happens when two adults go trick or treating a week before Halloween. Will they get candy or will they be arrested?